Throughout the academic year there will be events and opportunities for involvement in experiences related to the book and themes related to it. Examples of events include: faculty and community lecture series, community service opportunities and book discussions. Visit this page for ongoing updates to our schedule of events. 5 p.m., doors open at 4:30 p.m.
Festivals are an important part of Nepalese culture, as we learned from Conor Grennan in Little Princes (learn more about Nepali festivals). October marks the two biggest festivals in their calendar: Dashain and Tihar. Please join us for a celebration of these beautiful festivals in a celebration of Nepalese culture, including traditional Nepalese food. See a sample of SCSU’s 2011 celebration in this video [click here for video]. Tickets will be available at the kiosk in Atwood the week before the event OR at the information desk in Atwood. 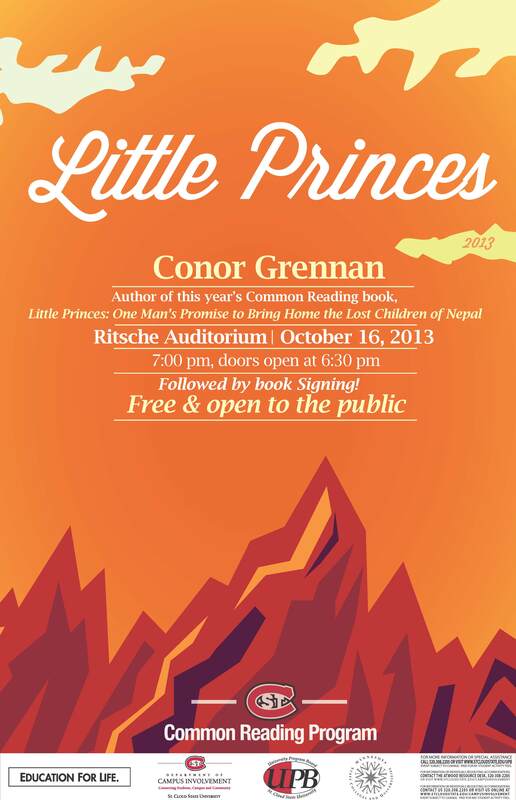 The author of this year's Common Reading book, Little Princes: One Man's Promise to Bring Home the Lost Children of Nepal ﻿will be speaking at Ritsche Auditorium at 7:00 p.m. (doors open at 6:30 p.m.) followed by book signing! Free and open to the public. Scholarship Essay prompts available here on the website. New first-year students at SCSU and students who are part of the SCTCC Connections Program can win a scholarship for SCSU tuition and fees for Spring 2014. Scholarships range from $125-$500. Four copies of student essays are due at 4pm in CH 208, the Office of Academic Initiatives, University College. Essay Competition winners and scholarships announced.